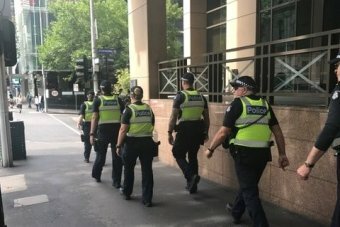 Victorians have been urged not to “cower to terrorism” and continue with their plans over the holiday period amid heightened security in Melbourne after four men were charged over an alleged plot to stage an Islamic State-inspired attack on Christmas Day. Police arrested seven people during counter terrorism raids at properties across Melbourne’s north-west on Friday. 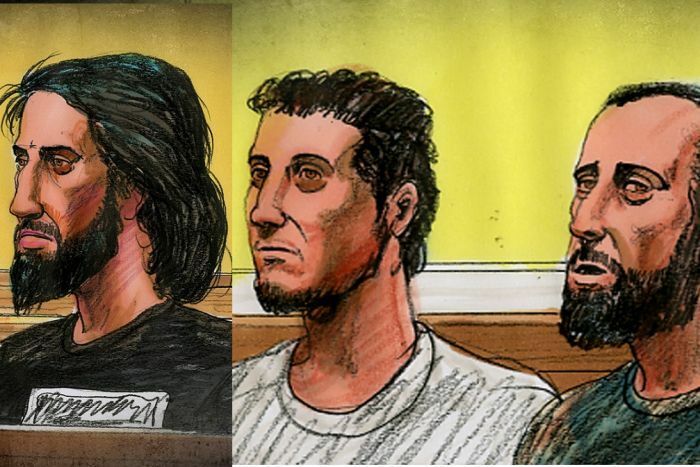 Three of those people — 26-year-old Abdullah Chaaranim of Dallas, 21-year-old Hamza Abbas of Flemington and 24-year-old Ahmed Mohamad of Meadow Heights — were charged with planning a terrorist attack. Ibrahim Abbas, 22, from Broadmeadows was also charged with the same offence and appeared in court on Saturday. The court heard Abbas sustained head injuries and a black eye during his arrest in a raid on his home. There was a heavy police presence outside court for case. He has been remanded in custody and will face court again in April. A 20-year-old woman and a 26-year-old man from Meadow Heights, and 21-year-old man from Gladstone Park, were released without charge on Friday. Police said they believe the group was planning to use explosives and other weapons at high-profile Melbourne landmarks Federation Square, Flinders Street Station and St Paul’s Cathedral — most likely on Christmas Day. Photo: Abdullah Chaaranim (L) Hamza Abbas (C) and Ahmed Mohamad (L) were charged over the alleged terror plot. Emergency authorities joined Victorian Premier Daniel Andrews at Federation Square on Saturday to call on the community to continue with their holiday plans. Victoria Police Chief Commissioner Graham Ashton said the public should have confidence in anti-terrorism security measures in place over the Christmas break. Security will be increased in and around Melbourne’s CBD and at the Boxing Day Test. “That’s [extra security] not because we have specific intelligence that we are concerned about,” he said. Mr Andrews paid tribute to Australian authorities for thwarting the alleged plot. 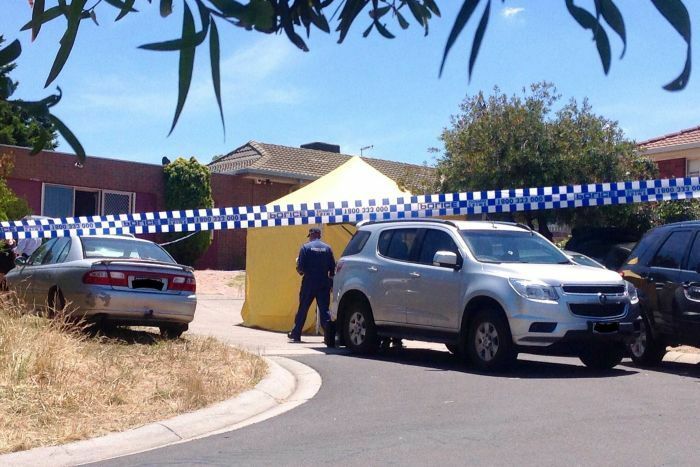 About 400 officers from Victoria Police, Australian Federal Police, ASIO and other agencies, including officers from Western Australia and New South Wales, took part in Friday’s operation. “Can I again reiterate on behalf of all Victorians just how proud we are of the work that Victoria Police have done to foil this plot against institutions in the centre of our city, the centre of our culture,” he said. The Federation of Islamic Councils condemned the alleged plot, saying it had nothing to do with the teachings of Islam. “We are literally sick and tired of some young people in our community seeking to terrorise other people and trying to blame that on religion,” its president Keyser Trad said. Anglican Archbishop Philip Freier encouraged worshippers to attend services at St Paul’s Cathedral this weekend. “We always have security present and that will be mildly enhanced,” he said. “We certainly look forward to continuing our worship through Christmas Eve, Christmas Day, unaffected by these things. Posted on December 25, 2016, in ConspiracyOz Posts. Bookmark the permalink. 2 Comments.